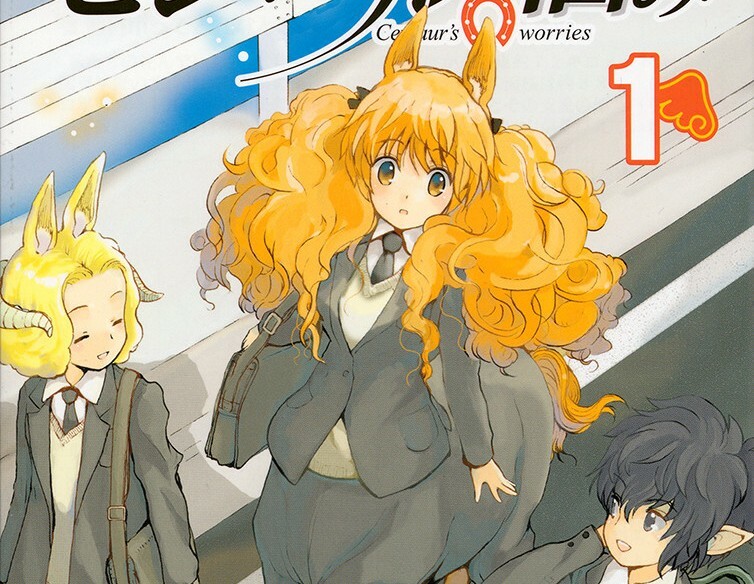 Centaur’s Worries is, predictably, about a centaur – her name is Himeno, and she goes to high school like any average random anime schoolgirl. Except she’s a centaur. And all of her friends are other monsters, be it imps or saytrs or angels or whatever the hell else. 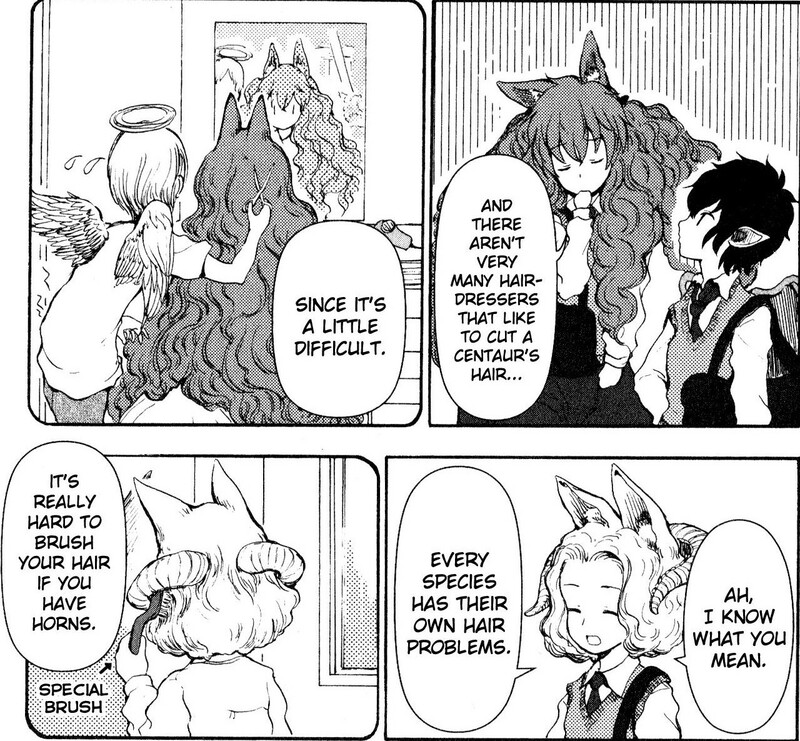 In fact, normal humans do not exist in this manga – all the various creatures who are monsters to us are plain humans in this setting, as different as different ethnicities would be to us. It’s all rather odd, and a bit heavy-handed at times, especially when an entire chapter is spent lecturing on how “if humans had evolved differently, then maybe they would discriminate over something as silly as skin color!”. While the story itself is rather straightforward, just being a regular high-school-girls slice of life plot, it’s made automatically different by jumping into this bizarro world of monster men. The history of the world is mentioned in passing, and sounds horrifying – centaurs were used as mobile knights and transportation slaves, and tampering with an angel’s halo (made out of hair) is considered a hate crime. Tiger-men were driven to extinction because it became unfeasible to keep a carnivorous diet, and the lizard people of Antarctica are considered third-class citizens, referred to with racial slurs. The amount of thought put into this setting is both creepy and absurd – the end of every chapter has a short interlude about various species and how they’ve evolved to be how they are. Land creatures have six limbs in this world, and apparently that just led to various different offshoots of humans, with the extra pair of limbs turning into centaur bodies or angel wings or mermaid fins. But they’re all still human, and so “interspecies” romances are apparently commonplace. If this sounds highly disturbing, that’s because it most definitely is – the first chapter shows a hypothetical angel/centaur fetus in utero, and it was one of the creepiest things I’ve ever seen in a manga, right next to the loli dog a few chapters later. As creepy, distasteful, and weird as I find this manga, it’s still rather interesting, mostly because of the sheer amount of detail put into its world. It’s just hard for me to appreciate it when it’s all about lesbian monsters and dogs with human heads and such. 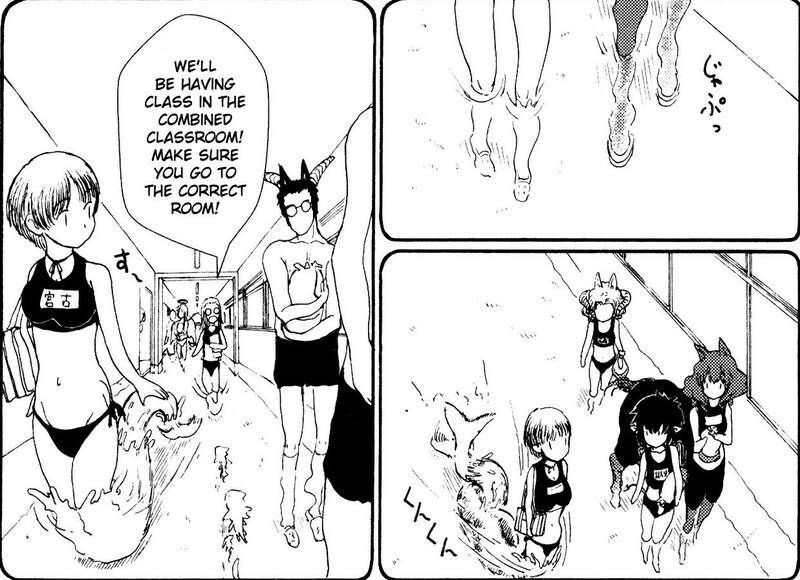 Centaur’s Worries is at its best when it’s just about the girls being in high school, where they happen to be fantastical creatures. When it starts going into too much detail about the whys and hows of being these creatures is when it becomes unsettling. As I say every week, check it out for yourself – something as odd as this might be right up your alley.